Now here's a penguin that wears his heart on his sleeve. Actually, his chest. 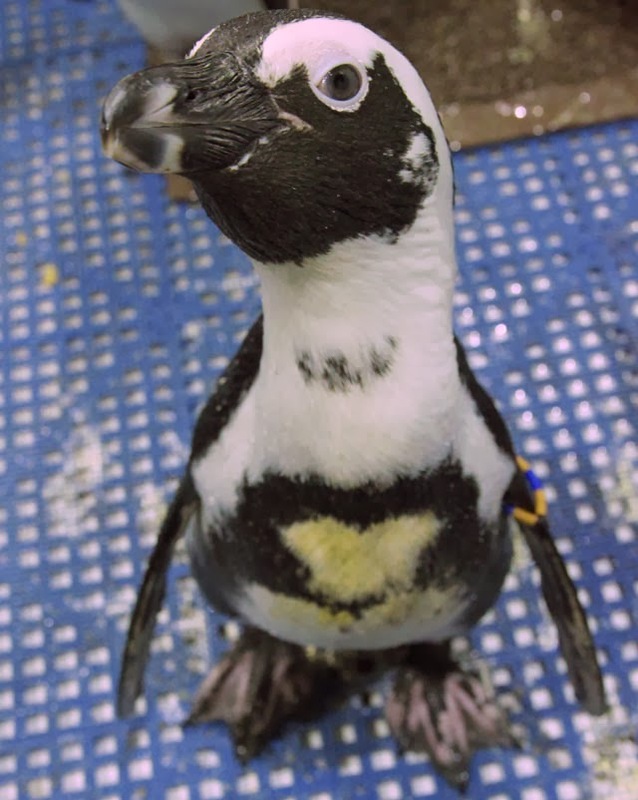 We have mentioned in previous blogs that the African penguins have spot patterns on their chests that are unique to each penguin, sort of like our finger prints. Being that we just celebrated Valentine’s Day, I would like to introduce you to one of our African penguins who has a very fitting spot pattern. This is Quoin II he has a blue and brown bracelet on his left wing. He was born at the Aquarium on May, 25, 2010, and his parents are Alfred and Treasure II (formerly profiled in another Valentine's Day post!!). 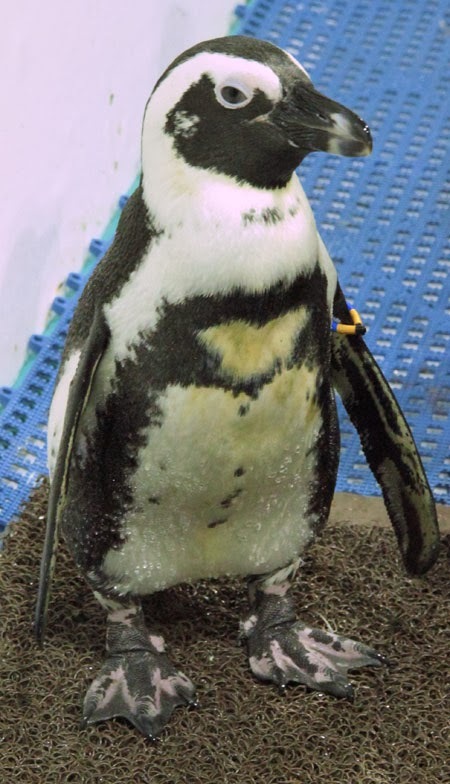 If you remember from previous blog posts juvenile African penguins have a different feather pattern than adults. They won’t get their adult plumage until they are about a year and a half to two years old. So when he molted from his juvenile feathers to his adult feathers we were quite surprised to see that Quoin’s spot pattern resembled a heart shape right on the middle of his chest. Quoin adult plumage revealed a distinct heart shape! Quoin is named after an island in Mossel Bay, South Africa, that was once an African penguin breeding island. Quoin is an old English word for a wedge of metal, or wood used elevate muzzle loading canons and describes the physical appearance of the island. 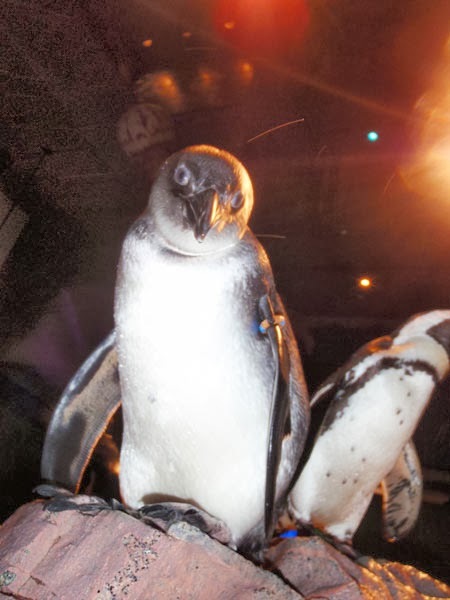 You can read some of our more “romantic” blog posts about the penguin breeding programs here at the Aquarium. 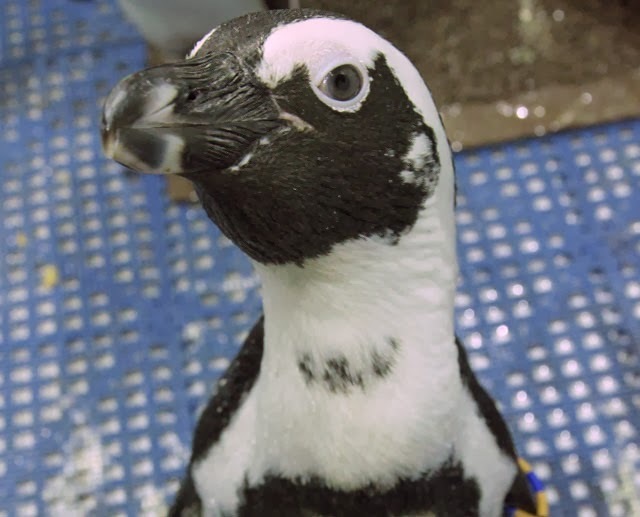 Our penguins are part of a species survival plan for African penguins, which are endangered in the wild. Then it's time for them to join the rest of the colony in the exhibit!